In Australia? You can buy a copy directly from Tablelands Press ($25 including postage) and it will be sent with a receipt. A Hospital Bed at Home is a linked collection of true stories about the experience of being a carer during the weeks, months and years that can stretch between the day someone you love is diagnosed with an incurable, fatal disease and the day of his or her death. Couples facing separation after forty years together; a workaholic with three small children and a dying, angry wife; an Irish immigrant called home to nurse an ailing father who cannot, or will not, eat; a Buddhist couple striving for serene acceptance of a brain tumour… The patients and carers profiled in these stories bring to their challenging situations the gamut of typically human strengths and weaknesses, plus all the baggage of their pre-existing relationships. 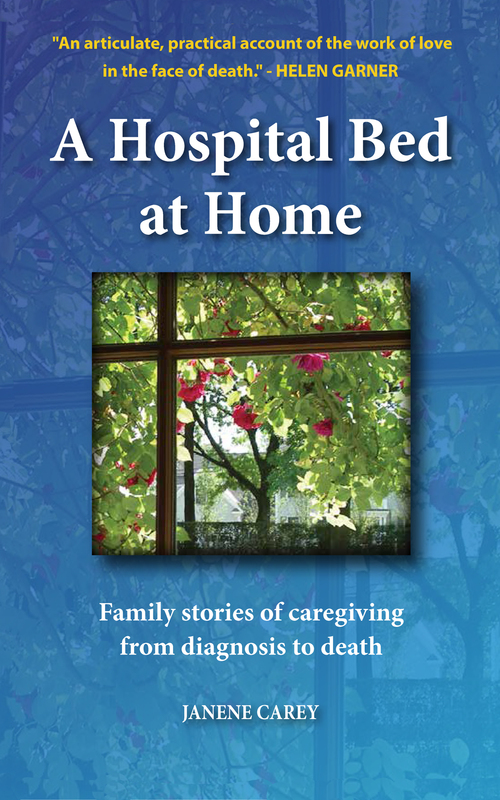 The narratives are intensely personal and biographical, but the insights and information they contain about illness, caregiving and dying at home have profound and general relevance. The author’s reflections on these topics are woven throughout, linking the individual stories and concluding with a gritty memoir about caring for her own mother, an anxious optimist who was ravaged by cancer. Or if you are in Australia and don’t want to wait 2-4 weeks for the book to arrive from the UK or USA, use the PayPal button to buy a copy directly from Tablelands Press ($25 including postage) and we will send it to you with a receipt. Tell me if you would like your book autographed!